Wataru seems to be adapting well to life on Promised Island, but that doesn’t mean it’s always easy. With a heck of a lot of sisters to look after, Wataru always has his hands full. When Karen gets lost and then Aria seemingly disappears, it’s Big Brother to the rescue once again! Now that summer break is over, the kids are all back in school. And fall can only mean one thing – the Sports Festival! Although he’s terrified because he lacks athletic ability, Wataru must choose which event he will compete in. Whatever he decides, Kaho and the rest of the girls will try their best to cheer him on to victory! 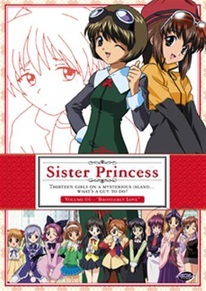 Sister Princess: Brotherly Love (SRP $29.98 DVD) is a DVD-only release, including four complete episodes in both English 5.1 and Japanese 2.0 language versions, with English subtitles. Extras include: clean opening and closing animation, a reversible cover, behind the scenes with Monica Rial (Sakuya), Shelly Calene-Black (Chikage) & John Swasey (Jeeves) and ADV previews.